Bernd Heinrich Wilhelm von Kleist (18 October 1777 – 21 November 1811) was a German poet, dramatist, novelist and short story writer. The Kleist Prize, a prestigious prize for German literature, is named after him, as was the Kleist Theater in his birthplace. Kleist was born into the von Kleist family in Frankfurt an der Oder in the Margraviate of Brandenburg. After a scanty education, he entered the Prussian Army in 1792, served in the Rhine campaign of 1796, and retired from the service in 1799 with the rank of lieutenant. He studied law and philosophy at the Viadrina University and in 1800 received a subordinate post in the Ministry of Finance at Berlin. In the following year, Kleist's roving, restless spirit got the better of him, and procuring a lengthened leave of absence he visited Paris and then settled in Switzerland. There he found congenial friends in Heinrich Zschokke and Ludwig Wieland (1777–1819), son of the poet Christoph Martin Wieland; and to them he read his first drama, a gloomy tragedy, The Schroffenstein Family (1803). In the autumn of 1802, Kleist returned to Germany; he visited Goethe, Schiller, and Wieland in Weimar, stayed for a while in Leipzig and Dresden, again proceeded to Paris, and returning in 1804 to his post in Berlin was transferred to the Domänenkammer (department for the administration of crown lands) at Königsberg. On a journey to Dresden in 1807, Kleist was arrested by the French as a spy; he remained a close prisoner of France in the Fort de Joux. On regaining his liberty, he proceeded to Dresden, where, in conjunction with Adam Heinrich Müller (1779–1829), he published the journal Phöbus in 1808. In 1809 Kleist went to Prague, and ultimately settled in Berlin, where he edited (1810/1811) the Berliner Abendblätter. 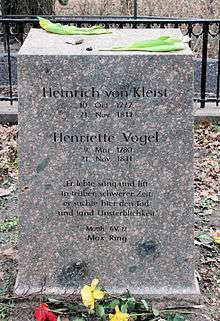 Captivated by the intellectual and musical accomplishments of the terminally ill Henriette Vogel, Kleist, who was himself more disheartened and embittered than ever, agreed to do her bidding and die with her, carrying out this resolution by first shooting Vogel and then himself on the shore of the Kleiner Wannsee (Little Wannsee) near Potsdam, on 21 November 1811. According to the Encyclopædia Britannica Eleventh Edition, "Kleist's whole life was filled by a restless striving after ideal and illusory happiness, and this is largely reflected in his work. He was by far the most important North German dramatist of the Romantic movement, and no other of the Romanticists approaches him in the energy with which he expresses patriotic indignation." 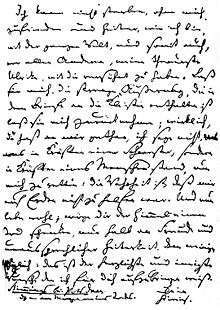 In the spring of 1799, the 21-year-old Kleist wrote a letter to his half-sister Ulrike in which he found it "incomprehensible how a human being can live without a plan for his life" (Lebensplan). In effect, Kleist sought and discovered an overwhelming sense of security by looking to the future with a definitive plan for his life. It brought him happiness and assured him of confidence, especially knowing that life without a plan only saw despair and discomfort. The irony of his later suicide has been the fodder of his critics. His first tragedy was The Schroffenstein Family (Die Familie Schroffenstein). The material for the second, Penthesilea (1808), queen of the Amazons, is taken from a Greek source and presents a picture of wild passion. More successful than either of these was his romantic play, Käthchen of Heilbronn (Das Käthchen von Heilbronn) (1808), a poetic drama full of medieval bustle and mystery, which retained its popularity for many years. In comedy, Kleist made a name with The Broken Jug (Der zerbrochne Krug) (1808), while Amphitryon (1808), an adaptation of Molière's comedy, received critical acclaim long after his death. Of Kleist's other dramas, Die Hermannsschlacht (1809) is a dramatic work of anti-Napoleonic propaganda, written as Austria and France went to war. It has been described by Carl Schmitt as the "greatest partisan work of all time". In it he gives vent to his hatred of his country's oppressors. This, together with the drama The Prince of Homburg (Prinz Friedrich von Homburg oder die Schlacht bei Fehrbellin), which is among his best works, was first published by Ludwig Tieck in Kleist's Hinterlassene Schriften (1821). Robert Guiskard, a drama conceived on a grand plan, was left a fragment. Kleist was also a master in the art of narrative, and of his Gesammelte Erzählungen (Collected Short Stories) (1810–1811), Michael Kohlhaas, in which the famous Brandenburg horse dealer in Martin Luther's day is immortalized, is one of the best German stories of its time. The Earthquake in Chile (Das Erdbeben in Chili) and St. Cecilia, or the Power of Music (Die heilige Cäcilie oder die Gewalt der Musik) are also fine examples of Kleist's story telling as is The Marquise of O (Die Marquise von O.). His short narratives influenced those of Kafka and the novellas of the Austrian writer, Friedrich Halm. He also wrote patriotic lyrics in the context of the Napoleonic Wars. A Romantic by context, predilection, and temperament, Kleist subverted clichéd ideas of Romantic longing and themes of nature and innocence and irony, instead taking up subjective emotion and contextual paradox to show individuals in moments of crises and doubt, with both tragic and comic outcomes, but as often as not his dramatic and narrative situations end without resolution. Seen as a precursor to Henrik Ibsen and modern drama because of his attention to the real and detailed causes of characters’ emotional crises, he was also understood as a nationalist poet in the German context of the early twentieth century, and was appropriated by Nazi scholars and critics as a kind of proto-Nazi author. To this day, many scholars see his play Die Hermannsschlacht ("The Battle of the Teutoburg Forest", 1808) as prefiguring the subordination of the individual to the service of the Volk (nation) that became a principle of fascist ideology in the twentieth century. Kleist criticism of the last generation has repudiated nationalist criticism and concentrated instead mainly on psychological, structural and post-structural, philosophical, and narratological modes of reading. Kleist's The Broken Jug is one of the most staged plays of the German canon (1803–05). In the play, a provincial judge gradually and inadvertently shows himself to have committed the crime under investigation. In the enigmatic drama The Prince of Homburg (1811), a young officer struggles with conflicting impulses of romantic self-actualization and obedience to military discipline. Prince Friedrich, who had expected to be executed for his successful but unauthorized initiative in battle, is surprised to receive a laurel wreath from Princess Natalie. To his question, whether this is a dream, the regimental commander Kottwitz replies, "A dream, what else?" Kleist wrote his eight novellas later in his life and they show his radically original prose style, which is at the same time careful and detailed, almost bureaucratic, but also full of grotesque, ironic illusions and various sexual, political, and philosophical references. His prose often concentrates on minute details that then serve to subvert the narrative and the narrator, and throw the whole process of narration into question. In Betrothal in St. Domingo (Die Verlobung in St. Domingo) (1811) Kleist examines the themes of ethics, loyalty, and love in the context of the colonial rebellion in Haiti of 1803, driving the story with the expected forbidden love affair between a young white man and a black rebel woman, though the reader's expectations are confounded in typically Kleistian fashion, since the man is not really French and the woman is not really black. Here for the first time in German literature Kleist addresses the politics of a race-based colonial order and shows, through a careful exploration of a kind of politics of color (black, white, and intermediate shades), the self-deception and ultimate impossibility of existence in a world of absolutes. Kleist's work also delved into the realm of rhetoric. Most notable for his use of error and understanding its importance, Kleist's devices used were misspeaking, misunderstanding, mistaken identities, and other confusions of the sort. In his works one can see the most prevalent use of rhetoric within Penthesilea. In the story moments of violence, seduction and war all hinge upon errors in language. Through these errors, Kleist shows how error can influence everyday situation and can be the causation of serious problems. As a sum, Kleist's use of error explores what one can make of ironic errors within speech. Kleist is also famous for his essays on subjects of aesthetics and psychology which, to the closer look, show a keen insight into the metaphysical questions discussed by philosophers of his time, such as Kant, Fichte and Schelling. In the first of his larger essays, On the Gradual Production of Thoughts Whilst Speaking (Über die allmähliche Verfertigung der Gedanken beim Reden), Kleist claims that most people are advised to speak only about what they already understand. Instead of talking about what you already know, Kleist admonishes his readers to speak to others with "the sensible intention of instructing yourself." Fostering a dialogue through the art of "skillful questioning" is the key behind achieving a rational or enlightened state of mind. And yet, Kleist employs the example of the French Revolution as the climactic event of the Enlightenment era whereby man broke free from his dark and feudal chains in favor of liberty, equality, fraternity. It is not that easy though for Kleist. Man cannot simply guide himself into the future with a rational mind as his primary tool. Therefore, Kleist strongly advocates for the usefulness of reflection ex post facto or after the fact. In doing so, man will be able to mold his collective consciousness in a manner conducive to the principles of free will. By reflecting after the fact, man will avoid the seemingly detestable inhibitions offered in rational thought. In other words, the will to power has "its splendid source in the feelings," and thus, man must overcome his "struggle with Fate" with a balanced mixture of wisdom and passion. The metaphysical theory in and behind Kleist's first essay is that consciousness, man's ability to reflect, is the expression of a fall out of nature's harmony, which may either lead to dysfunction, when the flow of feelings is interrupted or blocked by thought, or to the stimulation of ideas, when the flow of feelings is cooperating or struggling with thought. A state of total harmony, however, cannot be reached. Only in total harmony of thought and feeling life and consciousness would come to be identical through the total insight of the mind, an idea elaborated and ironically presented in Kleist's second essay "The Puppet Theatre" or "On the Marionette Theater" (Über das Marionettentheater). In a simulated dialogue, Kleist has one of the interlocutors comment that marionettes possess a grace humans do not, a view which contradicts all aesthetic concepts of the past. Our consciousness and capacity for reflection cause us to doubt ourselves or become self-conscious, and prevent us from acting with the singlemindedness and purity of an animal or a puppet. And yet, consciousness is the effect of eating from the tree of knowledge, and we cannot escape it, as long as we are barred from Eden. The interlocutor suggests that the only way out of this dilemma would be to go all the way through, because the garden of Eden could possibly be open on the other side: if we continue to become more intelligent, wiser, and more self-aware, we may eventually be able to carry out the actions we choose, with the same confidence and harmony as a marionette dancing on the strings of a puppeteer. Consciousness creates a split in our nature, rendering us neither animals nor gods. The ultimate development of humankind would be to bring these two parts of ourselves into harmony and no longer suffer doubt or internal conflict. The ending of the essay might seem hopeful, but it leaves the question open as to whether this kind of perfection will ever be possible. It is difficult to determine Kleist's intentions or personal view, because the two interlocutors in the dialogue are obviously presented in an ironic way. Rather than a serious proposal of Kleist's ideas it seems more like an ironic play on the vain ideals of classicism and romanticism. This essay also shows Fichte's influence on Kleist. Similar to Kleist, Fichte had emphasised man's ability and necessity to develop his mind in infinity, without ever being able to reach identity with the absolute, because the individual's existence just hangs on the difference. Without Kleist saying this expressedly, works of art, such as his own, may offer an artificial image of this ideal, though this is in itself wrenched out from the same sinful state of insufficiency and rupture that it wants to transcend. Kleist's philosophy is the ironic rebuff of all theories of human perfection, whether this perfection is projected in a golden age at the beginning (Hölderlin, Novalis), in the present (Hegel), or in the future (as the philosophers of the enlightenment and still Marx would have seen it). His essays show man, like the literary works, torn apart by conflicting forces and held together on the surface only by illusions, like that of real love (if this was not the worst of all illusions). Jeronimo, for example, in Kleist's The Earthquake in Chile, is presented as emotionally and socially repressed and incapable of self-control, but still clinging to religious ideas and hopes. At the end of a process marked by chance, luck and coincidence, and driven by greed, hatred and the lust for power, embodied in a repressive social order, the human being that at the beginning had been standing between execution and suicide, is murdered by a mob of brutalized maniacs who mistake their hatred for religious feelings. The ending of this novella could be used to describe Kleist's concept of life as well as his philosophy and aesthetics, expressed in the ironic style which fits the content: "And sometimes ... it almost seemed to him, that he ought to be happy." His Gesammelte Schriften were published by Ludwig Tieck (3 vols. 1826) and by Julian Schmidt (new ed. 1874); also by Franz Muncker (4 vols. 1882); by Theophil Zolling (4 vols. 1885); by K. Siegen, (4 vols. 1895); and in a critical edition by Erich Schmidt (5 vols. 1904–1905). His Ausgewählte Dramen were published by K. Siegen (Leipzig, 1877); and his letters were first published by Eduard von Bülow, Heinrich von Kleists Leben und Briefe (1848). Plot: The last three days Kleist's life. With his lover, Henriette Vogel, dying of cancer, Kleist philosophizes about life and welcomes his planned suicide. Kohlhaas oder die Verhältnismäßigkeit der Mittel (2012), a German film directed by Aron Lehmann is loosely based on Kleist's Michael Kohlhaas. Amour Fou (2014), directed by Jessica Hausner, nominated in the Un Certain Regard category at the Cannes Film Festival 2014, with Christian Friedel playing Heinrich and Birte Schnoeink playing Henriette. The film purports that Henriette does not, in fact suffer from any type of tumour but that her symptoms have psychological causes. 1 2 3 4 5 One or more of the preceding sentences incorporates text from a publication now in the public domain: Chisholm, Hugh, ed. (1911). "Kleist, Bernd Heinrich Wilhelm von". Encyclopædia Britannica. 15 (11th ed.). Cambridge University Press. pp. 845–846. 1 2 3 Heinrich von Kleist, The Marquise of O– and other stories. Ed. and translated by David Luke and Nigel Reeves. (New York: Penguin Books, 1978), 7. ↑ Sng, Zachary. The Rhetoric of Error from Locke to Kleist. Stanford. Stanford University Press. 2010. Chapter 5. 1 2 3 Heinrich von Kleist, On the Gradual Production of Thoughts Whilst Speaking. Ed. and Trans. by David Constantine. (Indianapolis: Hackett Publishing, 2004), 405. 1 2 Heinrich von Kleist, On the Gradual Production of Thoughts Whilst Speaking. Ed. and Trans. by David Constantine. (Indianapolis: Hackett Publishing, 2004), 410. ↑ van Hoeij, Boyd (16 May 2014). "'Amour Fou': Cannes Review". Hollywood Reporter. Retrieved 17 May 2014. Banham, Martin, ed. (1998). The Cambridge Guide to Theatre. Cambridge: Cambridge University Press. ISBN 0-521-43437-8. Croce, Benedetto (1924). "Kleist." In: European Literature in the Nineteenth Century. London: Chapman & Hall, pp. 52–59. Helbling, Robert (1975). The Major Works of Heinrich von Kleist. New York: New Directions. ISBN 0-8112-0563-0. Jacobs, Carol (1989). Uncontainable Romanticism: Shelley, Brontë, Kleist. Baltimore: Johns Hopkins University Press. Lamport, Francis John (1990). German Classical Drama: Theatre, Humanity and Nation, 1750–1870. Cambridge: Cambridge University Press. ISBN 0-521-36270-9. Maass, Joachim (1983). Kleist: A Biography. New York: Farrar, Straus, and Giroux. Meldrum Brown, Hilda (1998). Heinrich Von Kleist The Ambiguity of Art and the Necessity of Form. Oxford: Clarendon Press. ISBN 0-19-815895-5. Minde-Pouet, Georg (1897). Heinrich von Kleist, seine Sprache und sein Stil. Weimar: Emil Felber. Parry, Idris (1988). "Kleist on Puppets." In: Speak Silence: Essays. Manchester: Carcanet. Servaes, Franz (1902). Heinrich von Kleist. Leipzig: E.A. Seemann. Steig, Reinhold (1901). Heinrich von Kleists Berliner Kämpfe. Berlin: W. Spemann. Wikimedia Commons has media related to Heinrich von Kleist. "St. Cecilia, or the Power of Music"